Video Poker is one of the very first video based casino games. Players have various options and have a lot more control as to what the results are than with video slots. The game is based on Texas Hold’em, meaning the hand rankings are the same and players have the ability to create combinations with the features offered in the game. There are multiple variations of video Poker, which are based on the same rules, but certain games provide more features with wild cards and jokers. The pay table can also be modified to provide bigger payouts for certain combinations while offering the same rewards for other combinations. Video Poker is very popular due to the reasons mentioned above and the fact that it provides some of the highest payout rates in the casino world with some games reaching well over 98%. However, this is due to the combination possibilities that exist with the features offered in each game. Most variations of video Poker provide winnings up to 4,000 coins while other can impress with progressive jackpots. The first video poker games appeared at around the same time as the first PCs in the mid-seventies. But these games were primitive when compared to the sophisticated video poker games of today. Video poker games got better when SIRCOMA became International Game Technology (IGT) and developed Draw Poker in the late seventies. The games became popular at brick-and-mortar casinos in the late eighties as players found them to be more relaxing than table games. Today, online casinos also provide the full range of video Poker games, which still provide the same set of rules. However, the games have not changed at all, but online casino developers have simply included more betting options, bigger jackpots, and many additional features. The most important part to remember about video Poker is that only combinations shown on the pay table will be rewarded. This means a pair of 2’s to 10’s will not provide any reward with Jacks or Better and a pair of jacks is the first reward opportunity. Each variation of video Poker includes the paytable on the screen while you play, allowing you to see all the possible reward opportunities. Video Poker can also be enjoyed in multiple variations. Each game provides multi-hand variations, meaning you can play more than one hand at a time and increase your winning opportunities. This will obviously increase the wager amount as more hands are played, but the great thing is that only one hand is used to hold cards among all the other hands. These multi-hand games provide the same payouts as the single-hand variations, meaning you will not have any disadvantage when it comes to choosing a 5, 10, 25, 50, or even 100 hand game to play. Since each variation of video Poker is very similar, it’s easy to learn the game, no matter what variation you have selected. Once the game has loaded, you will need to enter your bet value. With land-based casinos, you can simply choose a number of coins you would like to wager as the coin value will be fixed. Online variations provide you with the ability to choose different coin values and the number of coins you wager per hand. Increasing the number of coin per hand will also adjust the paytable to higher payouts. Additional coins basically provide multiplied rewards for each coin you add. Playing maximum bet will boost your jackpot to a higher multiplier reward, which only occurs when the maximum number of coins are wagered. Once your bet is set, press the deal button on the game, which will turn over the 5 cards on your screen. From these cards, you can choose the most valuable ones, including combinations and special cards such as wild deuces and jokers. Once these cards are selected, the game will hold them in place while replacing the remaining cards when you press deal again. Once the unwanted cards have been replaced, the game will assess the hand and provide payouts accordingly. For new players, we recommend keeping a Hold’em hands card close to see what each combination consists of to ensure the best rewards are created. Video Poker comes in many styles, which offer a unique game but use the same rules to allow players to easily switch between games and get used to what the game has to offer almost instantly. All the games are played in the same way and provide various betting options with land-based casinos and online casinos. However, Online casinos provide even more options as you have the ability to adjust the coin value as well. Here are the most common versions of video Poker found in casinos from around the world. 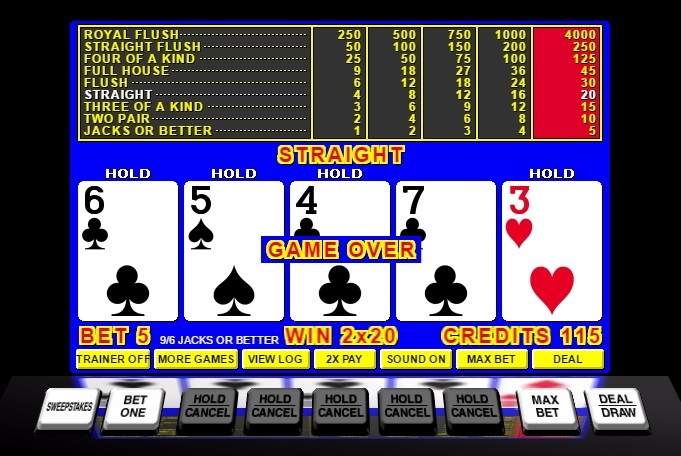 Jacks or Better is the most popular variation and is seen as the original video Poker game. New players find this game the easiest to get used to as it provides no additional features but still, includes all the reward opportunities. Playing maximum bet can deliver payout rates of 99.54%. Usually, the game offers up to 4,000 coins in rewards for combinations consists of a pair of Jacks or better. The game uses official Hold’em hand rankings to provide players with rewards. Aces and Eights is a variation very similar to Jacks or Better. The only difference is that the pay table has been modified to provide higher rewards for certain 4 of a kind combinations. These include 4 of a kind Aces, Sevens, and Eights. Lower combinations such as a pair of jacks or better and 2 pair will provide lower rewards, but much higher rewards for the combinations mentioned above. The jackpot winnings are still granted for a Royal Flush that will pay 4,000 coins. Deuces Wild is where the game rules are altered as well. Players will find all 2 cards (deuces) have the ability to replicate the value of other cards, basically provide the same features as joker cards. However, these can still offer winnings as a combination of their own meaning 3 or 4 of a kind 2’s will still reward accordingly. However, should a deuce appear among combination, it will act as those cards and provide a bigger combination. Once again, lower payouts have been adjusted to accommodate the extra feature, but a natural Royal Flush still pays 4,000 coins. An additional payout is also added that will provide the second highest jackpot when a Royal Flush occurs with a deuce involved. Double Bonus video Poker provides higher payouts for combinations consisting of 4 of a kind. However, other than Aces and Eights, the game offers higher winnings for all 4 of a kind combinations, which has been divided into 3 sections. The highest combination will pay 800 coins for 4 of a kind while the Royal Flush is still king with 4,000 coins. Double Bonus video Poker does not provide any additional features in regards to jokers or wilds. Double Double Bonus video Poker is basically the same as Double Bonus video Poker, but the payouts are even higher for 4 of a kind combinations. This does mean that lower payouts occur with other combinations, but the Royal Flush is still at the top with 4,000 coins. This variation is offered so players can choose where they think the bigger winnings will occur. Once again no wilds or jokers are presented in the game. Jokers Wild video Poker is rather obvious when considering the name. The game provides additional rewards with joker cards being involved with the pack. Since video Poker is played with a single deck, this will mean only 2 jokers are added to your game. The jokers can stand in as any card and provide better reward opportunities by extending combinations. With Royal Flush still at the top, some of the smaller payouts have been adjusted to accommodate the jokers. Tens or Better is exactly the same as Jack or Better, but the game will provide payouts for lower combinations such as a pair of tens. Not much has been adjusted with the pay table. However, some of the lower payouts have been decreased. No wilds or additional joker cards are added to the game and to activate the jackpot, you will need a Royal Flush. Bonus Deuces Wild is a combination of standard Deuces Wild and Double Poker video Poker. The game provides higher payouts for 4 of a kind deuces with an Ace as the 5th card along with other hyper payouts for 4 of a kind combinations. Beginners often overlook the fact that there are several variants of video poker in the industry. So before playing a game of video poker for real money, players should check out its rules and strategies. Since online casinos offer video poker for fun or real money, players should play a few games in the practice mode before wagering real money on it. Each video poker game has its own strategy chart, which is easily available online. Those who are just starting to play video poker tend to get confused with where to begin. The simplest video poker game is Jacks or Better. If players want to learn how to play video poker, they must start with this game and then move on to variants such as Double Bonus Poker and Deuces Wild.